Another day, another drone! Today we are discussing the 10 best drones with camera under $500, those every proud enthusiast should have. They include some of the best technology combined with the finest hardware. These are not the usual Toy Graded drones, they are 10 of the most powerful quadcopters currently in the market. All of them are packed with useful features and capable of great performance. As always we at DronesWorld aim to always bring you the best of the very best. Therefore, considering both price and quality we have compiled this list of 10 best drones under $500. If you seek high-performance drones at a lower price check our Top 10 Drones Under $300 list, you will love them! If you are looking for Toy Grade drones with awesome features at a reasonable price we have also compiled a Top 10 Drones Under $100 list. So, let’s see what is the best drone with camera under $500 ! Table : What is the Best Drone Under $500 ? Note: This Top 10 List has been updated with the latest drone models released in early 2018. This little bugger has been nicknamed the flying camera due to its exceptional selfie capability. It’s the main reason for its existence in the first place – to up everyone’s selfie game! However, it does come with several additional factors that make it exceptionally good when it comes to the task at hand. We’ll talk about right below where you’ll find a lot of useful information about Breeze by Yuneec! You see, Yuneec Breeze comes with a total of 5 automated flight modes allowing for easy to use and intuitive controlling scheme. Other than that, it’s also noteworthy to mention Breeze’s IPS (Indoor Positioning System) which allows for reliable indoor (and outdoor) handling for every occasion. Sharing is caring, right? Well, what good are those awesome selfies if you have a tough time sharing them with your followers?! Luckily, Yuneec Breeze combats that in a brilliant manner by implementing a dedicated app which lets you snap, edit and share photos (and videos) to your favorite social media networks. Even thought it’s not the best drone under $500, we should not forget about the camera either… after all, the main purpose of Yuneec Breeze is to take excellent aerial selfies. With that in mind, it comes as no surprise to see a high-end CMOS sensor with 13 effective megapixels. It is capable of recording 4K footage at 30 frames per second and even comes with Electronic Image Stabilization system (EIS). With EIS on, the software will stabilize your footage but will limit you to 1080p. That basically means you have to choose between smooth 1080p footage or shaking 4K one. Zerotech Dobby is another miniature (and this time around foldable) drone primarily meant for taking awesome aerial selfies, just like the previous one on this list. It has a nice little camera and is extremely stable, but it can’t be considered as the best drone with camera under $500. It has some minor drawbacks which we’ll touch later on. For now, let’s see what sort of general performance can you expect from Zerotech Dobby! Just like I already mentioned above, Dobby is another miniature selfie devices boasting with a fully fledged 4K camera. However, we are talking about a pretty small image sensor here that still has 13mpx. As for the video resolutions, Dobby can capture 4K but without electronic image stabilization. If you tune the resolution down just a bit you will be able to experience all wonders of EIS and still receive results in full HD. The quality is actually pretty good for its size, but the results cannot be compared with those of bigger (and better) drones under $500. Still – for aerial selfies and similar casual tasks, Zerotech Dobby is more than suitable! Dobby is an impressively small drone with just 135 x 65 x 34 millimeters when folded and weighs in at close to 200 grams. WIth those numbers taken into account, there’s no doubt Dobby is a proper pocket drone in every meaning of that phrase. Moving forward, this little bugger is powered by the powerful Qualcomm Snapdragon SOC with 2GB RAM, quad-core CPU, and Adreno 330 GPU. Features are an important aspect so it’s really nice to see some fully autonomous flight modes with this one. It’s all made true by GPS+GLONASS positioning systems which allow seamless stability at any given time. In fact, I believe Zerotech Dobby is the best selfie drone as far as flying stability is concerned. It’s the best, hands-down! Unfortunately, its specifications aren’t exactly its highest selling point. While operating range is sitting at the standard numbers for selfie drones (roughly 100 meters), battery duration won’t be able to cut it with just 5 to 8 minutes of flying. Traxxas Aton is a completely different kind of a drone compared to the previous 2 models of drones under $500. Instead of being a miniature selfie drone, Traxxas Aton is actually a huge quadcopter capable of reaching extremely high speeds. Additionally, there’s also a Plus package in which you’ll get a 2-axis gimbal that basically transforms it into a potent aerial photography drone. Yup – Traxxas Aton is both a racer and an aerial photography drone, something we rarely see in the industry nowadays. So, it seems interesting to you, you might as well read the next 2 paragraphs to learn more about it. So how exactly does Traxxas Aton work? Well, the key is in its 3 special flying modes – Sports, Photo, and Expert. While the Photo mode greatly increases the drone’s stability and reduces overall speed and maneuverability… Sports mode provides you with the fastest possible performance, surpassing 50mph top speed with ease. Expert mode allows you to further customize your flying settings and caters the scheme to your specific needs. Performance in terms of specifications isn’t half bad either. Traxxas Aton, thanks to its powerful 3000mAh 3S LiPo battery can endure up to 15 minutes of flying per charge. Operating range is solid too – ranging to approximately 300 meters in clear and unobstructed areas. Overall, Traxxas Aton is definitely an interesting drone and a worthy purchase for people who are not yet sure whether they’d like to race or record aerial photos and videos. Is the Plus version worth the extra money? Honestly speaking here, Traxxas Aton Plus version is definitely worth the money for everyone looking to pass on cheap with a proper aerial photography platform. That’s because there is a pretty good mechanical gimbal coming inside this package. Best of all, it works with GoPro cameras meaning you’ll be able to record professional-quality aerial footage with Traxxas Aton. Even though we are talking about a 2-axis gimbal, it’s still more than good for beginners to learn the basics of aerial photography. After taking a short break with selfie drones, we’re back at them again with Wingsland S6, a highly affordable specimen of the so-called selfie drone family. It does have a pretty good camera and a transmitter that resembles those of DJI mini-drones (Spark, Mavic Pro and Mavic Air), but lacks in specifications (it’s definitely not the best drone under $500 all around). However, don’t let that fool you – Wingsland S6 is really cheap so it’s understandable that there had to be some price cuts along the way. There’s one thing Wingsland S6 does extremely well – features. Not only does it sport GPS but barometer as well, allowing it extraordinary hovering precision. That’s followed by additional flight-oriented features such as course lock, home lock, orbit, follow me and many more. Another awesome thing about it is the camera, boasting with 4K30fps capability and EIS. However, you won’t be able to combine these 2 – if you want stabilized footage I am afraid you will have to lower the resolution down to FHD… but luckily, you’ll get to record it in 60fps! Now that you’ve had the chance to see all the good parts of Wingsland S6, it’s time to take a closer look at its biggest downsides – specifications. You see, this little bugger is not exactly the greatest selfie drone out there as far as operating range and battery duration are concerned. With cca 30 to 80 meters of operating range (good enough for selfies but atrocious for anything else) and 7 to 10 minutes of flight time, I’m sure there are better selfie drones out there. Once again though – Wingsland S6 is insanely cheap so, even with such lowly specs, it still preserves great value for money… which is basically why I decided to list it here. There are 2 main versions of Hubsan H501 series available – H501S and H501A. The latter is cheaper but doesn’t sport FPV… which is one of the best features of the S version. So, that’s pretty much the only reason why we’ll be focusing on Hubsan H501S for the time being. Starting off with the general appearance, it has to be said that this little bugger looks absolutely dashing. Hubsan H501S is not a toy drone by any means. This beauty is rocking powerful brushless motors that are capable of developing quite the speed while remaining much more durable than their brushed counterparts. Another thing that draws attention is the fact that Hubsan H501S sports GPS as well as altitude hold, making it fly with optimal stability. Return to home is here as well so there is no need to worry about it flying down from the sky once it reaches low battery voltage. By far, the best thing about Hubsan H501S is its camera. We are not talking about some crazy 4K at 60fps kind of deal here. Nope… I mean, just look at the price of this drone and you’ll come to your senses. Instead, Hubsan H501S can record 1080p videos at 30fps but does so brilliantly. It’s all thanks to a high-quality CMOS sensor that creates sharp and clean looking scenes at all times. Plus – the camera is bound to a 5.8Ghz video transmitter… Yes, that means you’re gonna enjoy a latency-free live feed that will bring you complete immersion. The provided controller even sports a nice little display with an integrated 5.8Ghz receiver so you won’t need any additional devices to enjoy FPV. Last but not least, Hubsan H501S specs are as follows – cca 300 meters of operating range and up to 20 minutes of flight time. The golden middle of this list belongs to Upair One. We are talking about a gorgeous DJI Phantom series lookalike with a clean glossy white finish combined together with a stylish white controller too. One of the best things with Upair One is the integrated 7-inch display on the controller which lets you witness lag-free 5.8Ghz FPV feed in solid quality. When combined with everything else Upair One has to offer, you’ll actually come to a realization that this is a superb drone! If you google for Upair One you will eventually stumble upon 3 different models with different price tags. Why is that so? Well, that’s because Upair One comes with 3 different cameras – full HD, 2.7K and 4K ones. However, you have to keep in mind that the price gap isn’t that huge so going for the 4K one up front is well worth the extra money. All 3 models contain the same 2-axis gimbal which does its job of eliminating shakiness and vibrations quite well. The 4K footage quality is exceptional although you’ll notice an occasional stutter since its being recorded in only 24fps. The transmitter itself is made out of high-quality plastic too so I’d say the folks over at Upair haven’t really made any major price cuts during the manufacturing process. Just like I already stated above, it comes with a 7-inch FPV dsplay which is like icing on an already well-built cake! In addition to the camera (1 of the 3 explained above), Upair One also has several other key characteristics worthy of mentioning. For instance, it runs on brushless motors and is actually quite fast for its size. Furthermore, Upair One boasts with extra reliability in the form of auto return to home feature. It sports waypoints too as well as altitude hold which greatly helps in terms of taking excellent aerial photos and videos. So, with all of that being taken into account, I’m sure the majority of you will agree with me when I say Upair One is an outstanding entry-level aerial photography drone and well worth the 5th spot on this list. 3DR Solo is coming at us aggressively with unparalleled performance at its price range. It rocks a powerful LiPo battery that can take up more than 20 minutes of flight time (max 22 minutes) which is not to be taken lightly. Furthermore, its operating distance is up to the task as well, featuring around 800 meters in clear and open areas. As far as features are concerned, they are not too far from amazing either. 3DR Solo is a smart drone featuring GPS, altitude hold and plenty of supporting aerial photography features such as cable cam and follow me. Overall, if you are interested in budget aerial photography platform, 3DR Solo is a great starting point! The best thing about this little bugger is not its specifications or excellent performance… not even its superior flight stability either… The best thing about 3DR Solo is the fact that it’s just so damn cheap – and that’s all because of huge price drops over the course of last year or so. Since 3DR decided to pivot to other industries, they decided to set 3DR Solo prices at bottom low points making it among the best value for money models available. However, another company has beaten them to it… Wonder who? Well, MJX with their Bugs 2W that’s coming right up! The bronze medal in this list goes to a drone that costs half the amount of our price cap for today. Yup – MJX Bugs 2W is now on special promotion and you can get it for roughly $250. And believe me – that’s a very good deal considering what a great drone we are talking about here. After all – it would not have been listed at the 3rd spot if it wasn’t for its outstanding performance! Well, you’ve guessed it – the best thing about MJX Bugs 22 is the value for money it effectively delivers. It runs on 1806 1800kv brushless motors meaning you’ll get better flying speed as well as much more durability. Plus – it’s smart! Smart as in – it comes with GPS, altitude hold and 3 types of return to home. And believe it or not – those are the essential features that every smart drone needs to have… and for much less than $500; that’s simply amazing! Talking about amazing things draws me to this little bugger’s camera. It records in 1080p resolution at steady 30 frames per second making it ideal for casuals who would like to record their dearest moments. The image quality is pretty good too, and so is the 5Ghz WiFi downlink that comes in HD. With that being said, the downlink is good for up to 500 meters, but that greatly depends on what smartphone you own. If you think the FPV downlink range is good, then wait till you hear about operating range. But, to keep the tensions flowing, I’ll start off with the battery. 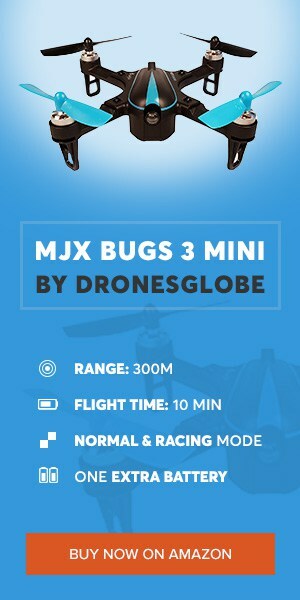 MJX Bugs 2W sports a 1800mAh 2S LiPo battery that gets it anywhere from 15 to 18 minutes of flight time. And finally, operating range – MJX Bugs 2W is bound to exceed your expectations by going up to 1 kilometer away from its transmitter. Such a lengthy operating range is something we rarely see from a highly affordable smart drone such as this one. The runner-up as our best drone under $500 is Bebop 2 by Parrot. It sports several radical improvements over the original which, truth be told, hasn’t gone especially well with the critics. Luckily, Parrot Bebop 2 seems to ba superior at virtually every aspect making it quite interesting for both casual and semi-professional buyers. So, with all that taken into account, let’s see what’s this little birdie all about! SkyController 2 is a must! With the basic features such as altitude hold, GPS, and auto return to home all being implemented in the standard package, Parrot Bebop 2 has every right to be called a smart drone. However, if you are interested in more advanced features you will have to make in-app purchases which is something I cannot stand. Still, extra features are not that expensive yet they add a ton of additional functionalities to an already excellent device. The camera isn’t half bad either. With a sophisticated electronic image stabilization software and a solid 14MPX sensor, you’ll be experiencing marvelous FHD aerial footage and photos. Specifications-wise, thanks to SkyController 2, Parrot Bebop 2 will be able to go up to 2 kilometers away from it. Battery duration has been improved too in reflection to the original, with approximately 20 minutes of active flying per charge. If you’re looking to dash out the complete $500 budget on Parrot Bebop 2, then I warmly recommend going for the Adventurer package. It costs just slightly more than our $500 cap but it’s well worth it. Not only are you getting the SkyController 2 bundled together with the package, but you’re also getting a whole bunch of other goodies. For instance, you’ll get a sweet looking backpack that fits all package content nicely inside. Last but not least, you’re also getting Cockpitglasses 2 which are basically Parrot’s VR headset model. They aren’t that advanced but are comfy and do their job well. Yup – at the moment, the best drone under $500 mark is definitely DJI Spark. Even with just the standard package, DJI Sparks offers exceptional performance and poses as the perfect travel-friendly camera birdie. With lots of smart features, great camera, and a foldable controller, DJI Spark is set to rule. However, with the release of DJI Mavic Air which is, truth be told, set at a slightly higher cost, things could go downhill for the Spark. Still, considering the price gap, I’d say DJI Spark will be untouched at least when it comes to budget-oriented buyers. DJI Spark is a similar drone to the ones we featured at number 10 and 9. Yes, it’s small, has a great camera and a bunch of supporting features so it can basically be considered as a selfie drone. However, DJI Spark is much more than that because: A – it has a 2-axis gimbal that allows for unparalleled image stabilization… B – it has full support for DJI GO app which brings forth a ton of useful features. Among those, you’ll find awesome ones such as gesture control and facial recognition as well as the most basic ones such as GPS and altitude hold. The camera is excellent too – rocking a 12MPX sensor capable of recording 1080p videos in 30fps. Keep in mind though – this FHD footage will be completely stabilized and shake free which cannot be said for those selfie drones portrayed above. Now I know that our budget for today has been set to maximum $500, but I just have to say a couple of words about the DJI Spark Fly More Combo. You see, the biggest thing about it is the fact that it involves a dedicated DJI Spark transmitter which looks a lot like that of DJI Mavic Pro. It’s foldable and actually boosts the default operating range up to amazing 3 kilometers. If we combine that with roughly 15 minutes of flight time, I’m sure we can all agree that DJI Spark is a marvelous little drone and well deserving of the top spot on this list! What kind of drones can you find for less than $500? If you’re merely a casual user, chances are high you’ll end up with a drone that costs below $500. Casual drones are plentiful in this price range… As a matter of fact, some of you probably won’t go even close to the $500 mark. For those of you who are interested in aerial photography, there are several viable models to choose from that fit within this price point. Some of them don’t come with a camera though, so that’s one thing to keep in mind. Third and the final drone type you’ll see below the $500 mark is the selfie drone. Yup – miniature (often foldable) drones with smart features and great cameras are conquering the market and getting a fair share of the cake. As far as the operating range is concerned, for drones under $500 anything below 300 meters just won’t be able to cut it. Except if we are talking about selfie drones which tend to go up to only about 100 meters. Still, if you’re looking to get a drone that’s slightly above average, you should aim for at least 500 to 600 meters of operating range. Battery duration is one of the most crucial aspects of every drone out there on the market. When it comes to models going for below the $500 mark, you’ll be looking at roughly 10 to 20 minutes of flight time. Such a huge span is solely due to the fact there are so many different types of drones available, ranging from racers, selfie drones, and aerial photography platforms. In terms of camera quality, for less than $500 I doubt you can find a good 4K camera. Yes, there are several selfie drones out there boasting with 4K footage and EIS, but can only use the latter in combination with FHD footage. On the other hand, there are devices with FHD and hardware stabilization such as DJI Spark and the upcoming Walkera PERI. So, for that reason, I suppose the average camera quality you should go for is at least an FHD capable sensor with EIS or mechanical stabilization. EIS or more commonly referred to as Electronic Image Stabilization is a comprehensive piece of software embedded into various camera-bearing devices such as smartphones and drones. EIS essentially does the same thing just like mechanical gimbal – it stabilizes the footage making it shake free while eliminating that nasty jello effect. However, EIS stabilizes the footage by zooming it in and then using algorithms to level it out. In reality, this means you won’t be able to record in native resolutions with EIS turned on. In other words, if your drone owns a 4K camera, if you turn EIS on you’ll only be able to select 1080p. When talking about mechanical gimbals, we’ll mainly focus on 2-axis and 3-axis ones, even though there are models featuring only 1 axis. They have miniature brushless motors and a whole bunch of supporting algorithms and gyroscopes to accurately level out the camera using the motor rotations. So, as far as the quality of stabilization is concerned, mechanical gimbals beat EIS without much discussion. But, in addition to image stabilization, gimbals also allow users to rotate their cameras independently of their drone’s movements, which is of crucial importance for any kind of professional aerial work. The only real downside – mechanical gimbals are more expensive, quite heavy and power hungry, meaning the drones carrying them will have bulkier batteries or slightly shorter flight times. Purchasing a drone under $500 might not be such an easy task as some of you initially thought. Luckily, it’s not because of a lack of good models. On the contrary, there is an abundance of great drones out there on the market… up to the point of each person having to specifically choose one that’s catered to their needs. Without any doubt 10 of the best Top 10 Drones Under $500 we can currently find in the high-price market. A dream to any drone enthusiast. Do you already own one? Are you considering buying now? Which one? Tell us in the comment section bellow, we at DronesWorld are always happy to hear from you. Joey Pentura is one of the co-founders and main writer of DronesWorld.net. Joey also contributes frequently to various other high profile drone websites and blogs. DronesWORLD.net participates in the Amazon Services LLC Associates Program, an affiliate advertising program designed to provide a means for sites to earn advertising fees by advertising and linking to Amazon.com.